JERUSALEM - A 3-foot-tall tablet with 87 lines of Hebrew that scholars believe dates from the decades just before the birth of Jesus is causing a quiet stir in biblical and archeological circles, especially because it may speak of a messiah who will rise from the dead after three days. If such a messianic description really is there, it will contribute to a developing reevaluation of both popular and scholarly views of Jesus, because it suggests that the story of his death and resurrection was part of a recognized Jewish tradition at the time. The tablet - probably found near the Dead Sea in Jordan, according to some scholars who have studied it - is a rare example of a stone with ink writings from that era - in essence, a Dead Sea Scroll on stone. It is written, not engraved, across two neat columns, similar to columns in a Torah. But the stone is broken and some of the text is faded, meaning that much of what it says is open to debate. Still, its authenticity has faced no challenge, so its role in helping to understand the roots of Christianity in the devastating political crisis faced by the Jews of the time seems likely to grow. The stone is not a new discovery. It was found about a decade ago and bought from a Jordanian antiquities dealer by an Israeli-Swiss collector who kept it in his Zurich home. When an Israeli scholar examined it closely a few years ago and wrote a paper on it last year, interest began to rise. There is now a spate of scholarly articles on the stone, with several due to be published in the coming months. Daniel Boyarin, a professor of Talmudic culture at the University of California at Berkeley, said the stone was part of a growing body of research suggesting that Jesus could be best understood through a close reading of the Jewish history of his day. "Some Christians will find it shocking - a challenge to the uniqueness of their theology - while others will be comforted by the idea of it being a traditional part of Judaism," Boyarin said. Given the highly charged atmosphere surrounding all Jesus-era artifacts and writings, in the general public and in the fractured and fiercely competitive scholarly community, as well as the concern over forgery and charlatanism, it will probably be some time before the tablet's contribution is fully assessed. It has been about 60 years since the Dead Sea Scrolls were uncovered, and they continue to generate controversy regarding their authors and meaning. The scrolls, documents found in the Qumran caves of the West Bank, contain some of the only known surviving copies of biblical writings from before the first century AD. In addition to quoting from key books of the Bible, the scrolls describe practices and beliefs of a Jewish sect at the time of Jesus. How representative the descriptions are and what they tell us about the era are strongly debated. For example, a question that arises is whether the authors of the scrolls were members of a monastic sect or mainstream. A conference marking 60 years since the discovery of the scrolls will begin today at the Israel Museum in Jerusalem, where the stone, and the debate over whether it speaks of a resurrected messiah, as one iconoclastic scholar believes, also will be discussed. "I couldn't make much out of it when I got it," said David Jeselsohn, the owner of the stone, who is a specialist in antiquities. "I didn't realize how significant it was until I showed it to Ada Yardeni, who specializes in Hebrew writing, a few years ago. She was overwhelmed. 'You have got a Dead Sea Scroll on stone,' she told me." Much of the text, a vision of the apocalypse transmitted by the angel Gabriel, draws on the Old Testament, especially the prophets Daniel, Zechariah, and Haggai. The expression "Thus said the Lord of Hosts, the God of Israel" appears many times, as does the name Jerusalem. Yardeni, who analyzed the stone along with Binyamin Elitzur, is a scholar on Hebrew script, especially of the era of King Herod, who died in 4 BC. 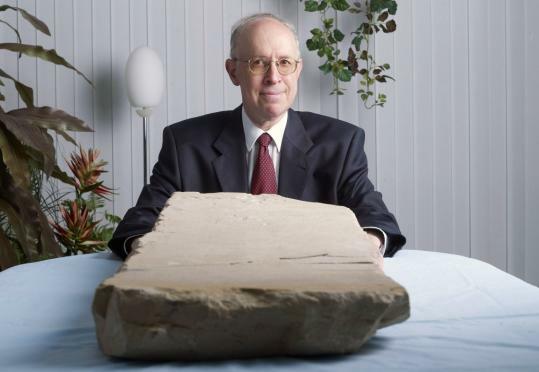 The two of them published a long analysis of the stone more than a year ago in Cathedra, a Hebrew-language quarterly devoted to the history and archeology of Israel, and said that, based on the shape of the script and the language, the text dated from the late first century BC. Yuval Goren, a professor of archeology at Tel Aviv University who specializes in the verification of ancient artifacts, did a chemical examination of the stone and said he knew of no reason to doubt its authenticity. It was in Cathedra that Israel Knohl, an iconoclastic professor of Bible studies at Hebrew University in Jerusalem, first heard of the stone, which Yardeni and Elitzur dubbed "Gabriel's Revelation," also the title of their article. Knohl posited in a book published in 2000 the idea of a suffering messiah before Jesus, using a variety of rabbinic and early apocalyptic literature as well as the Dead Sea Scrolls. But his theory did not shake the world of Christology as he had hoped, partly because he had no textual evidence from before Jesus. Knohl is part of a larger scholarly movement that focuses on the political atmosphere in Jesus' day as an important explanation of that era's messianic spirit. As he notes, after the death of Herod, Jewish rebels sought to throw off the yoke of the monarchy, which was supported by Rome.